You Must Have a Trade Account with Global Welding Supplies Ltd Before we can approve a Website Login. It couldn't be easier to set up an account with us. Just click here to download the application form. (Depending on browser, you may be required to right click here and "Save link as.." to save the file to your computer) Open the pdf application file on your hard drive, enter the required information and save. Print the form and remember to sign it at the bottom. 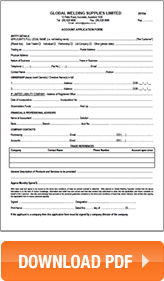 You can then email a scanned copy of the signed and completed application form to us. Please direct your email with all attached forms to [email protected]. Note: you must have Acrobat Reader installed on your computer to view these files. Downloading the reader is quick and it's free. To download Acrobat, click here or the icon on the right. In order to process Account Applications, GWS is required to collect an review company and/or personal information. Information collected by GWS complies with all statutory provisions for privacy and data protection, in particular, the Privacy Act 1993 (NZ) and the Information Privacy Principles and Codes of Practice. Our Terms and Conditions of Trade are included with our Account Application form. To view our Privacy Statement, Click here. If you have comments or questions about the form, just give us a call on 0800 536 774 (09 828 9888) and we'll be happy to assist you.